Item Number: 266-510PK 18926 Actual Weight: 10.5 lbs. 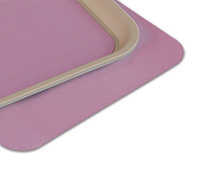 Sized to fit dental trays and provide the balance of strength to resist rips and absorbency for barrier protection. Tray covers are an easy barrier to prevent infection and minimize noise while improving the visibility of tools, burs and files on the tray.